This Quoizel Cody dual mount 2 light brushed nickel industrial pendant is detailed and attractive. It will look fantastic in any kitchen, small hallway, vestibule or landing. 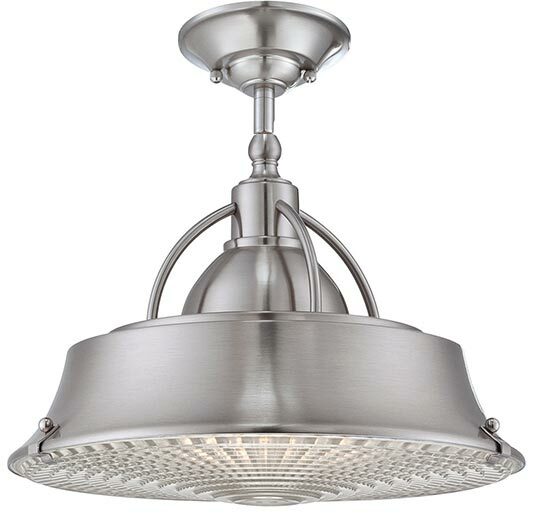 With a circular ceiling plate finished in brushed nickel and a height adjustable drop rod attached to a wide flared metal shade at the base of the slender stem, with curved bracing arms attached to the top. A lower ribbed glass shade helps reduce glare and diffuse the light. The Cody range features contemporary metal shaded fixtures inspired by industrial pendants of the past. The lower mounted clear ribbed glass diffuser shade adds a nostalgic flair to any setting and it’s convertible to a semi-flush fitting, please see smaller secondary image for details. Perfect for the industrial themed, traditional or contemporary kitchen and would look fantastic installed over a dining table, kitchen island, breakfast bar or worktop. Just as effective for any room with limited ceiling height when mounted as a semi flush fitting. The Cody dual mount 2 light brushed nickel industrial pendant is designed by Quoizel, founded in 1930 in New York. They relocated to Charleston in 1996 where they remain to this day. They remain a privately held, family-owned and operated business. Quoizel products are now being introduced to the UK market and have quickly built a reputation for their diverse, unique and fresh designs.